Flooring industry has arguably become more important than ever in the past few years. Advancements in floor styles, versatility, luxury, and aesthetics is set to push the future of flooring market to the next level. Smart flooring options are already becoming commonplace among people, as stylish home and workplace décor have become symbols of a high standard of living. As floors mostly cover a larger surface area of the room space, consumers are taking keen interest in selecting their flooring materials. In response, flooring industry players have also come up with variety of options which will complement the design aesthetics and as well stand the test of time. The green movement in this industry is showing a slight impact on flooring choices. Sustainable products choices such as cork, bamboo, and eucalyptus are gaining considerable traction in the residential and the commercial projects. Such products are also receiving a lot of attention among environmentalists and the press, as high quality flooring made from natural material is becoming an important part of the future landscape of the green movement. Speaking of this niche segment of flooring industry, the market for sustainable products will gain an edge over the traditional products as far as the flooring looks good & feels good. The flooring industry has observed the trends shifting from the conventional flooring solutions to more cost efficient and eco-friendly flooring materials. Rising installation of the new & innovative products have significantly driven the commercial flooring market across the globe. Not surprisingly, the advancements in the printing technology have brought new organic-type visuals to the products of flooring market. These days some of the luxury vinyl tiles (LVT) products can simulate and mimic natural stone and wood details to an extent that one will have to look twice to differentiate between the originals and the printed patterns. Such digital technology trends have enabled companies like Mohawk to make floor visuals look more realistic. These advanced digital printing and mechanical embossing technologies for ceramic tiles and LVTs have significantly broadened the scope of their application across the residential and as well the non-residential flooring markets. Residential flooring industry has already witnessed major adoption of flooring techniques in order to renovate or remodel the home space. Accounting for more than 50% of the overall flooring market in 2013, the residential application is expected to continue its lead over the coming years. The soaring demand for flooring from new construction, renovations, and replacements activities will be a prominent growth driver for the residential flooring market. The stone and ceramic tiles suppliers are seen targeting the online retail channels as a result of an upsurge in property resale of residential sector. 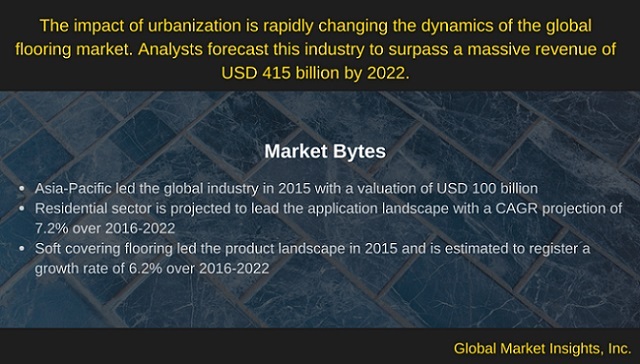 As per a report, ceramic tiles market is pacing forward and is likely to register a CAGR of 9.8% from 2016-2024, owing to the robust growth exhibited by the construction sector. With the recent trends of DIY, laminates in the residential flooring market will continue to take market share from other products, as the design of laminates makes them usable for home DIY projects. New housings and home renovations activities, owing to the rapid urbanization in emerging economies have ultimately provided huge market for flooring. Furthermore, the benefits of stain resistance, comfort, and durability offered by LVTs, wood and ceramic floorings is making a comeback in kitchens with more beautiful visuals and wood prints on tiles coupled with the ability of unique installation patterns. Speaking of wood, hardwood and softwood floorings are also getting highly popular, as they reflect the choices and individual styles of the owner. Hardwood flooring industry is likely to pave its way to great heights, given that the material is resilient, acoustic, and highly durable. Mahogany, walnut, chestnut, white oak, red oak, ebony, maple, pine cherry, and birch are some of the many types of species used prominently for hardwood flooring. The manufacturers are likely to take full advantage of this growing segment of flooring industry. As per a flooring market analysis, opportunities across the residential sector will rise at a tremendous pace and will drive flooring market size from residential applications, which is set to register a revenue of USD 220 billion by the end of 2022, expanding at a CAGR of 7% from 2015-2022. Over the past few years, luxury vinyl and carpet tile have been chipping out a major chunk of the non-residential flooring market. The flooring industry offers a broad spectrum of products comprising polished concrete, carpet, and resilient surfaces such as vinyl, linoleum, rubber, and cork. The non-residential sector covers the commercial and the industrial sectors of flooring market. As the flooring industry is coming up with more and more options in design, carpet tile continues to be one of the top commercial flooring trend. Ease of maintenance, high sustainability, and design innovations have significantly added to the aesthetics of commercial flooring. On these grounds, the non-residential flooring market has witnessed a growing deployment in schools, hospitals, healthcare, and offices as the LVTs and carpet tile have made significant inroads beyond its traditional use. These centers are mixing and matching flooring designs in their lobbies and corridors to give more aesthetic look to the buildings. The interior designers of new commercial or renovation construction have no shortage of choices to meet their design aspects and architectural requirements. As per estimates, flooring market share from commercial applications may surpass a revenue generation over USD 170 billion by 2022, at an annual growth rate of 6.5% over the period of 2016-2024. Of late, flooring industry has shown a remarkable improvement in performance and appearance. Tile, laminate, vinyl, and carpet flooring trends are continuing their prominence in the residential and the commercial sectors. Apart from these, floorings are also gaining prominence in other applications comprising aviation, aerospace, and automobile, as this floor covering industry is bursting with new technological developments and stylish trends. Global Market Insights, Inc. has a report titled “Flooring Market Size By Application (Commercial, Residential, Industrial), By Product (Seamless Flooring, Soft Coverings, Non-resilient Flooring, Resilient Flooring) Industry Outlook Report, Regional Analysis, Downstream Application Development Potential, Price Trends, Competitive Market Share & Forecast, 2012 – 2022” available at https://www.gminsights.com/industry-analysis/flooring-market-size .